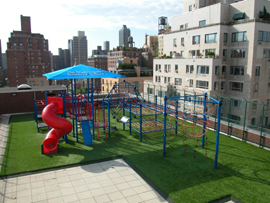 New HYBRID Playstructures Designed exclusively by Designed for Fun, Inc. 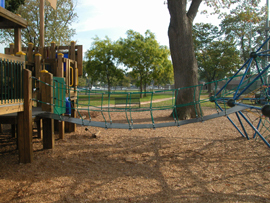 Play Equipment Manufactured by Berliner Seilfabrik, PlayVentures, Inc., & Henderson Recreation Equipment, Ltd.
Now everyone can get the best of both worlds: traditional composite deck playstructures linked to contemporary cable net structures. 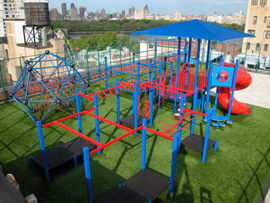 No other playground design firm can do this like Designed for Fun, Inc. 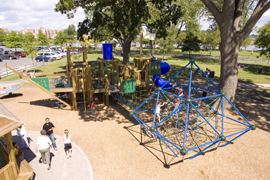 Being an exclusive designer and sales representative for both Berliner Seilfabrik, PlayVentures, Inc. and Henderson Recreation Equipment Ltd., our playground consultants are able to include and connect our clients' favorite play events as supplied by either manufacturer. 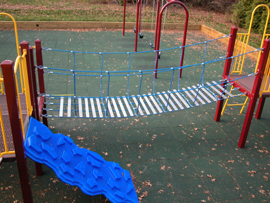 Using selected play components from PlayVentures, Inc. and Henderson Recreation, we can provide everyone's favorite slides, climbers, or overhead ladders, along with a myriad of other favorite play events. 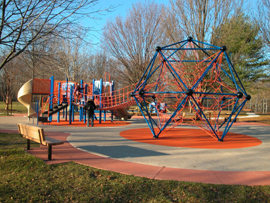 Using the play components available in Henderson Recreation's traditional PLAYSTEEL and PlayVentures, Inc. Playwood Plus product lines, we can also provide the level and type of handicap accessibility that is desired for your project. Or a customer designed Clipper Ship from the PlayVentures, Inc. Playwood Plus product line connected to a Berliner Jupiter with a 15 foot long suspension bridge, we can make it happen! Even if you are just thinking about livening up a traditional playstructure with a fun and exciting bridge, we can do that too. 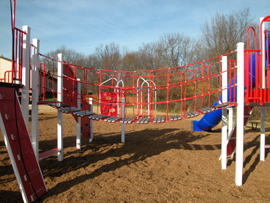 Check out the Berliner website at www.berliner-playequipment.com, the PlayVentures Inc. website at www.playventuresinc.com, and the Henderson Recreation Equipment, Ltd., website at www.henderson-recreation.com for more information on either of these two leading manufacturers. However, for more information on these exciting Hybrid Playstructures and the endless variety of what can be done when combining the best of both worlds, you can contact us directly.